I bought some of those cute little glass hanging containers last year, but I still haven't hung them up. I have been a horrible air plant Mother! My houseplants are on the once per month water diet, those that need spraying, misting or spritzing better hold up between times. I am So bad! 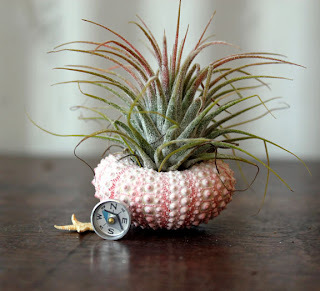 Tillandsias are fantastic! You can get creative with it :)I have a clump bulking up nicely inside a bird cage. What a fabulous idea!! Please post a photo on my Facebook page if you can. We'd all love to see it! My, my, Karen, we do have a lot in common. I, too, am a failure at most house plants. It's true they don't hold my interest the way outdoor plants do, so they have to take care of themselves. I do have a cactus plant that needs watering about four times a year, and it has a fake flower stuck to the top that for the longest time I thought was real! Your fish pot with the spider thing hanging out of its mouth is scary; I'm not sure I would want to see that in the middle of the night. We bought our daughter Katie this ceramic fish as a thank you for helping me out with one of my seminars. It's more silly than scary with its cross eyes! I've seen tillandsia in one of the nicer nurseries here but never at a time when it was convenient to buy--always had arms full of bags of potting soil or something at the time. I may have to make a special trip. They really are charming! I do best with the 'indoor' plants that I can grow 'outdoors' in summer such as bromeliads and crotons. 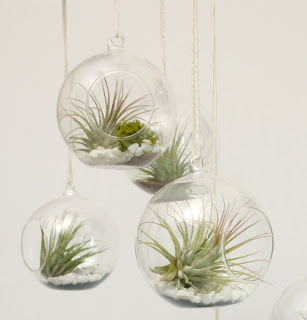 These air plants encourage me that perhaps I could try again! I'm sure you should be able to order these. Seems to be quite a lot of sites which look promising. Good luck! I like the air plant containers you've found. 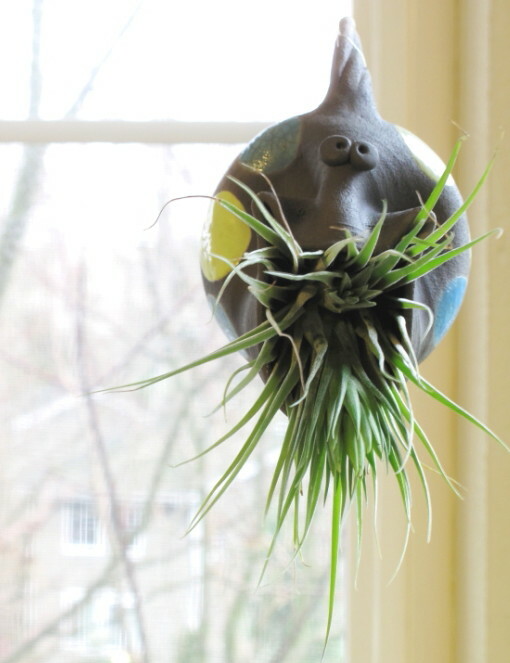 I always like finding unique items to show of my air plants. 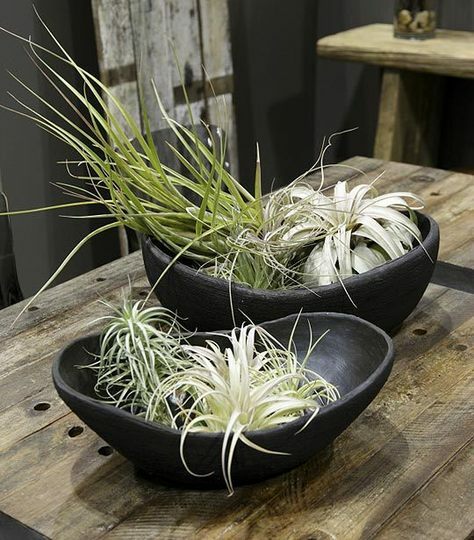 One thing about air plants is that they seem to take more water then most people realize, most require a good rinse or bath a couple times per week...seems to depend on the type of plant. That's good to know about the watering Gabe - thanks. I suspect a brightly lit bathroom would be a good location in that case?